LEN - www.lankaenews.com | Sirisenas gone blind ! Father is environment minister, daughter is environment disaster monster ! Whither SL ? Sirisenas gone blind ! Father is environment minister, daughter is environment disaster monster ! Whither SL ? (Lanka-e-News - 04.March.2018, 3.45PM) It is the bed of a tank which is most fertile, and If a tank is to be protected , the environs where there is valuable fertility should be safeguarded like life. That is why such a zone is demarcated as a reserve zone , and even plucking a leaf in that zone is considered as a punishable offence ,leave alone the devastation caused to it by president’s family. While such is the scrupulous protection that zone ought to be provided , Dudley Sirisena the brother of president Sirisena and the latter’s daughter Chathurika have deemed it right to build luxury hotels along the periphery of the Parakrama Samudraya tank detrimental to the environment in spite of the fact, Parakrama Samudraya tank is considered as a great treasure of the country , and should therefore be carefully safeguarded . What is rudely shocking is , Dudley built his hotel during the last regime, but Chathurika built her hotel ‘Thidas arana Lake’ after her president father was installed in office. It is by now an undeniable fact ,’his excellency’ the ‘honor –rubble ’ minister of environment has only so far succeeded in demonstrating day in and day out to the nation he is not worth his salt . In keeping with his lop sided policies instead of protecting the environment , he is allowing his family and daughter to treat a monumental treasure of the country as a plaything. 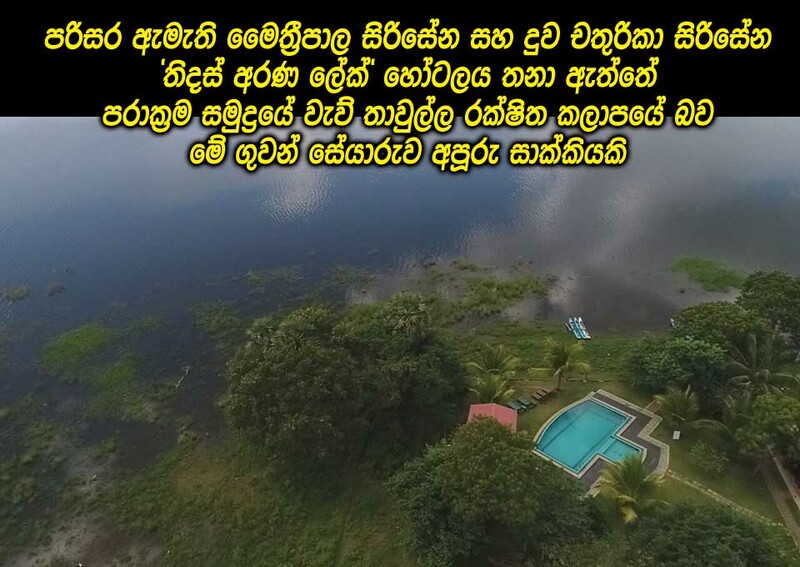 After Lanka e news always first with the news and best with the views espousing the cause of truth , exposed the luxury hotel ‘Thidas Arana Lake’of Chaturika on the 2nd , we have received many more photographs of that hotel . Based on the aerial view of the hotel it is most clear Chahurika had built this hotel absolutely unlawfully. 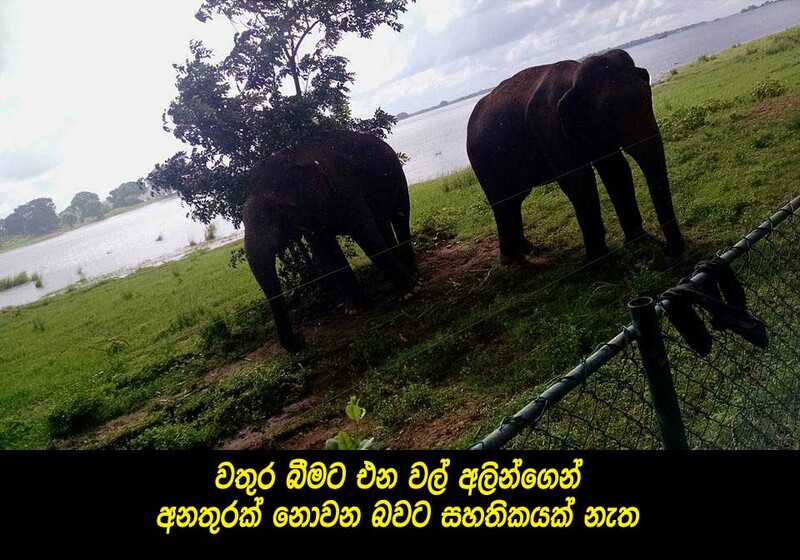 Chathurika of course is making money even by selling the elephants that come to drink water from the bank of the Dam. 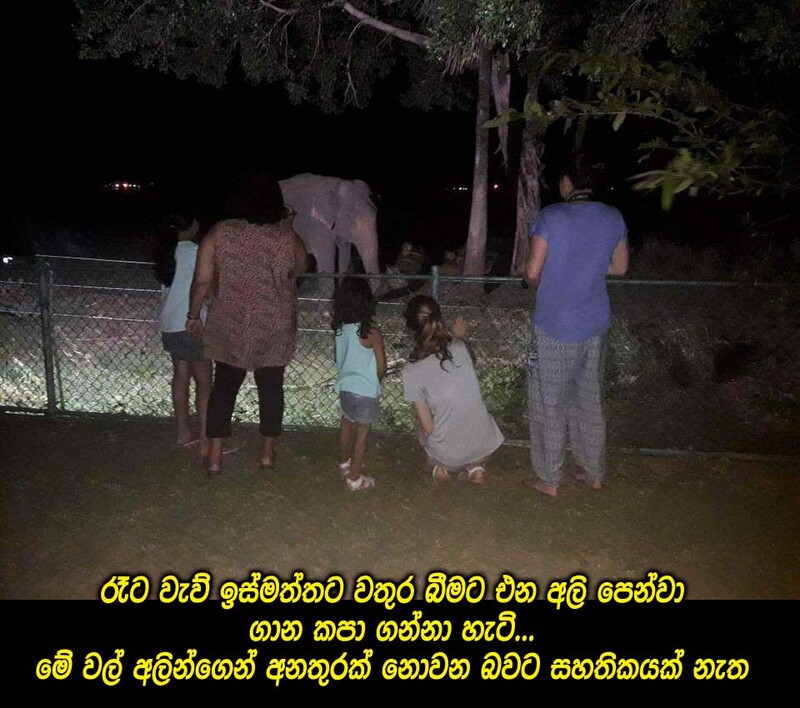 These elephants which come into the vicinity of the hotel are having no protection at all nor is there any guarantee for their safety .The poor Tachyderms are that unsafe. What Is even more interesting and intriguing is, while her father is talking loudly and proudly about his ‘mathata thitha’ attitude towards liquor, and is even crowing from roof tops against smoking , his own daughter is providing free liquor to the drivers of buses who are transporting tourists to her hotel following faithfully ‘mathata hitha’ policies diametrically opposed to her proud father’s much publicized ‘mathata thitha’ . Of course like father who would sacrifice any national and patriotic interest at the altar of his selfish self interests , her overriding concern too is promotion of her own business compromising all national concerns. In a country like Sri Lanka where ten –twelve environmental organizations panic and get perturbed , even if an offering is kicked , these same organizations remaining deaf, dumb and blind to the irretrievable disaster that is being wreaked on the environment , as long as their pockets are adequately filled by Sirisenas , is most deplorable, despicable and disgraceful. 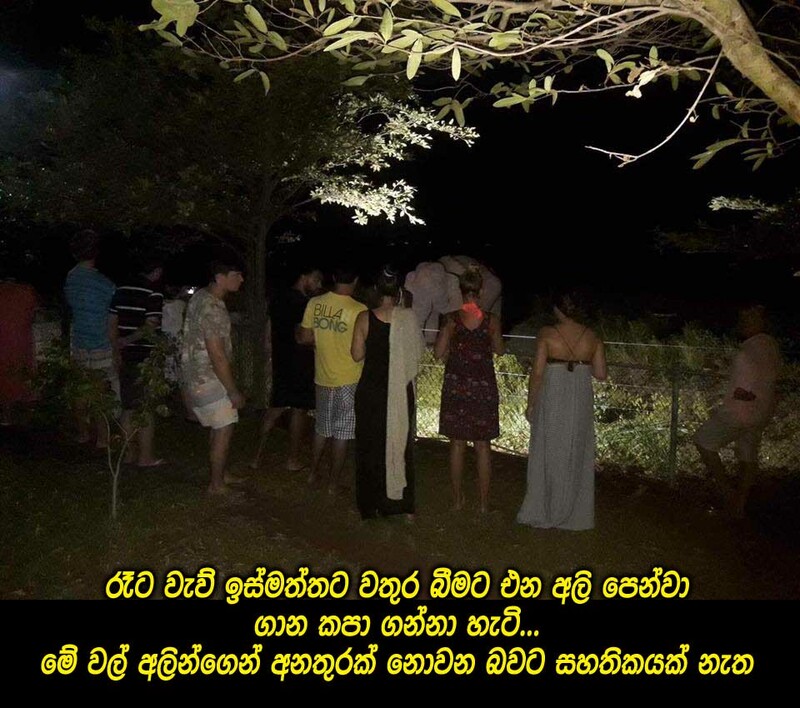 Previously in our news report it was revealed , the precious water that is meant for the cultivation of farmers of ‘Parakrama Samudraya’, instead of being saved are being wasted by opening the sluice gates of Parakrama Samudraya , for the only reason to rescue the hotel of Sirisena family from getting inundated.